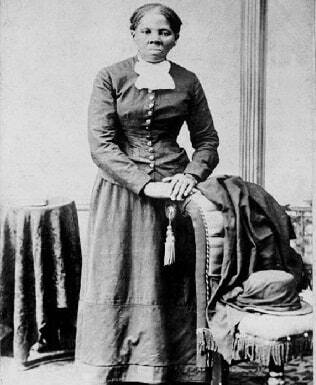 Harriet Tubman is probably the most famous woman from the period in U.S. history when the north, or the union, fought the south from 1861-1865 in The American Civil War. She was a woman who put her life on the line to do what she felt was right. She herself escaped from slavery and went on to become one of the most well known names in the Underground Railroad, where slaves of all ages including men, women and even kids sought freedom through a secret network of safe houses. From American Civil War facts about women during this time, we can see that many of them share common characteristics such as bravery, selflessness and determination. Read on for more interesting information on how Harriet Tubman helped operate the Underground Railroad and why she is such a hero today. Click here for a great selection of Amazon.com books about Harriet Tubman. Harriet Tubman was born Araminta Harriet Ross (and her nickname was Minty) before changing her name in adulthood to Harriet. When she was a teenager, she was permanently disabled from an injury sustained when an iron weight hit her head. A slave owner was attempting to stop a runaway slave, threw the weight, and she was hit instead. The injury from the iron weight caused her to continually suffer from headaches, seizures, vision problems, vivid dreams and narcolepsy throughout her life. In her older years she even underwent brain surgery to alleviate her painful symptoms. The decision to help other slaves came after Harriet Tubman gained her own freedom in 1851. She began by helping to free members of her own family. Harriet Tubman was born into slavery but, as was common for the time, her immediate family included both slaves and those who were free. It is believed that she helped over 300 slaves to freedom by the time the Underground Railroad had reached its end in 1863. She is known to have said that she "never lost a single passenger" on any of her 19 trips to the south to help free slaves. "Swing Low Sweet Chariot" was the song slaves would sing to signal to those working for the Underground Railroad that they wanted to escape and were ready to do so. Harriet Tubman was married twice. The first time was around the age of 24 to a free black man named John Tubman. After John died during the Civil War she remarried a man named Nelson Davis, a former slave who was ten years younger than her. She did not have any biological children but she and her second husband, Nelson, adopted a baby girl named Gertie. When Harriet Tubman escaped from slavery, a large reward for her return was posted with wanted posters. This brave woman took on many roles during the Civil War. She acted as spy, scout, nurse and soldier and even led an armed voyage to free several hundred slaves in South Carolina. She suffered from pneumonia and died at the age of about 94 years old. She is buried with military honors at Fort Hill Cemetery in Auburn, NY.